Full disclosure: the people who make Assetto Corsa put me in a race car and let me drive around a race track at a million miles per hour, simultaneously burning both rubber and the paper-thin veneer of journalistic ethics that prohibits having any fun on press trips. The idea was that by driving around the Autodromo di Vallelunga in real life I could fully appreciate just how accurately the developer had simulated the track in Assetto Corsa. In practice I was too busy concentrating on not flipping the car over and murdering everybody in a giant fireball to take any notes. Largely speaking however, all of the corners appeared to be in the right places. So well done. 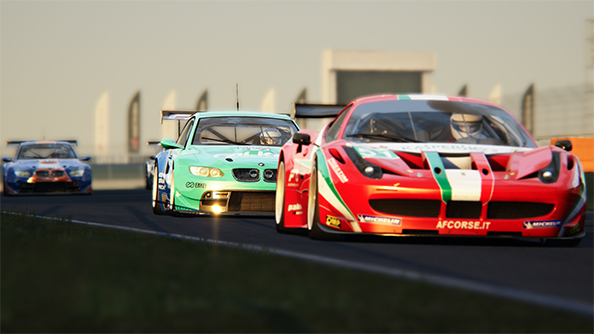 Assetto Corsa is currently in Early Access on Steam. 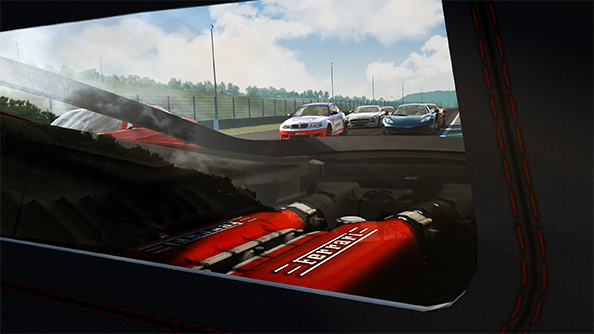 It’s a racing simulation from Kunos Simulazioni, a studio with a decade’s worth of experience in creating software simulations for professional, real world race teams. These are the same clever men and women who make specialised simulation software for the likes of Ferrari, to help them figure out if adjusting the weight of a screw by half a milligram will make their cars catch fire, backflip off the track and land in a ditch. So Assetto Corsa is a very serious sort of racing game based firmly in real world physics. Kunos proudly boasts the most realistic tyres ever seen in a game, for instance. The different afflictions that can befall your rubber in Assetto Corsa all sound like something out of a gynecologist’s handbook, with “graining”, “blistering”, “heat cycles” and “flat spots” all affecting the handling of your car. The motorised, moving wings that automatically deploy as certain cars reach higher speeds and demand more downforce aren’t just a visual effect either, rather they’re using proper aerodynamic physics calculations to accurately simulate their effect on the car’s handling. Assetto Corsa’s simulated Pagani, for example, uses the very same algorithms for adjusting its wings as the real car does. Pagani handed over the code themselves. You can ignore all of these fine details and enjoy the broader simulation if you like. Knowing nothing of the heat cycles of my tyres, I could still enjoy the experience of inexpertly driving cars, launching them into corners at excessive speeds, shifting into the wrong gear as I spin out on the gravel. 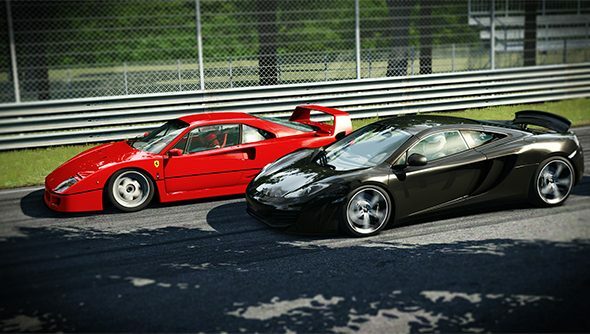 The unforgiving nature of the simulation takes some getting used to, necessitating a more considered and trained approach to track positioning and braking, but once your brain begins to tune into the weight and grip of the vehicle you’re in control of, Assetto Corsa is an intensely rewarding racer. The strict adherence to accuracy extends way beyond cars. Kunos have meticulously laser scanned circuits by driving a big laser-firing truck along them, mapping with millimetre-accuracy every corner, every bump and every groove before importing the resulting data into the game. This delivers a more accurate simulation of tarmac than the traditional method of tracing over satellite maps and building virtual tracks by the fallible hand of a human designer. 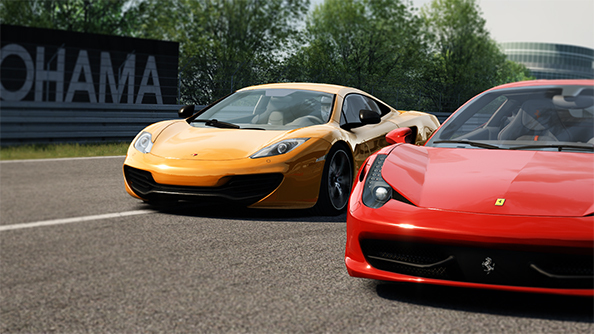 There are some concessions to videogaminess in Assetto Corsa. While the game is largely a sandbox with every car and track available from the outset, there’s also a career mode for those who want to work their way up from road cars to sportier models. You’ve got drift events, drag races and time attacks. Modding tools — the same tools used by the game’s developers — will allow people to add their own cars and tweak their own tyres. Maybe you want tyres that blister less. Maybe you want tyres that blister more. It’s up to you. There. Those are all the facts I have learned about Assetto Corsa. By all accounts Kunos seem to have had to do very little actual coding work themselves. Instead they’ve simply plugged massive amounts of meticulously gathered real world car data into a comprehensive and robust physics engine and then let the laws of the universe spit out a working simulator. Kunos have built a racing game using lasers and algorithms and science, and it seems to have worked. Really, it’s nature we should be applauding here.